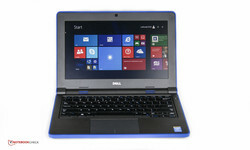 Dell presents an 11-inch laptop that is to fulfill the demands of everyday school life with its Latitude 3150. That also means that it needs a certain degree of rigidness, security and input device quality. The convenient size is ideal for mobile use. We put the laptop or netbook equipped with a frugal Intel Pentium N3540 quad-core processor, 4 GB of working memory and a 128 GB SSD through its paces. The present review sample currently costs 560 Euros (~$626). Other configurations can be found on the manufacturer's website. The lowest-priced configuration for 490 Euros (~$548) does not sport a non-volatile SSD, and the buyer has to be satisfied with a 250 GB HDD and weaker dual-core CPU instead. Acer's TravelMate focuses on some other key specs for 420 Euros (~$469). Instead of using a viewing-angle dependent TN screen from AU Optronics, it relies on a higher-quality IPS screen. Only a slow HDD was installed in our review sample. However, the large hard drive capacity of 500 GB was an advantage. We will closely examine just what other differences exist in the crucial features in form of build and input devices. The casing of the Education Latitude is exclusively made of plastic components. 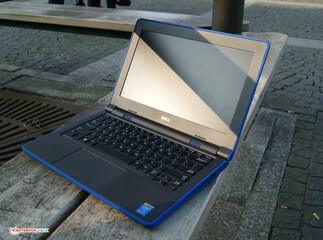 A blue, red or plain black rubber rim adorns the casing of Dell's laptop depending on personal preferences. At the same time, it protects the device against smaller bumps. The rough surfaces provide enough grip for transportation. We barely found any shortcomings in the build. The gap between the base unit and the border has been resolved nicely, and only the display's edge has a somewhat larger spacing to the bezel. Unfortunately, the display's back is a bit too easy to dent. Students who prefer browsing on the Internet rather than paying attention in class will soon be discovered because an LED lights up on the display's back when the network is active. Dell not only considers inattentive students, but clumsy ones as well. According to the manufacturer, the keyboard and trackpad are sealed, and thus they defy accidentally spilled fluids. Overall, the small, 1.3 kg review sample makes a robust and prepared impression. However, only permanent use in school routine will first be really conclusive. At least the manufacturer does everything right with the casing in view of the starting price of 490 Euros (~$548). Only the standard interface diversity for the review sample's size is found. Unfortunately, only one of the two USB ports supports the 3.0 standard. Since not all schools have projectors, etc. with an HDMI port, it would have been nice to see a VGA out. The base tray has to be removed for maintenance work. That is possible after releasing seven screws. Two notches help removing the tray without damage. It is consequently possible to access the storage device, battery, Wi-Fi module, working memory and even the inactively cooled (fan-less) CPU without many problems. 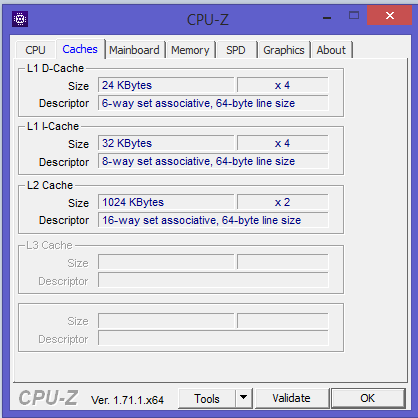 It is not possible to simply expand the 4 GB working memory with an additional module because only one memory bank is available. That excludes dual-channel mode at the same time. The manufacturer offers a computer cart for storing several Latitudes. It recharges as many as 30 devices simultaneously and has a lock mechanism for safe storage. Thus, freshly recharged laptops can be taken out at the beginning of class. This mechanism is available as managed and unmanaged. The former includes an Ethernet network switch for simultaneously maintaining connected laptops. Fortunately, the keyboard of the little laptop features standard dimensions, and students do not have to get used to a small keyboard size. Its responsiveness is crisp, and it has a medium drop. The space bar responds a bit faster than the other keys, which needs some familiarization. The keyboard will please touch-typists. The roughened keys provide the necessary grip and the lettering has a sufficient size. 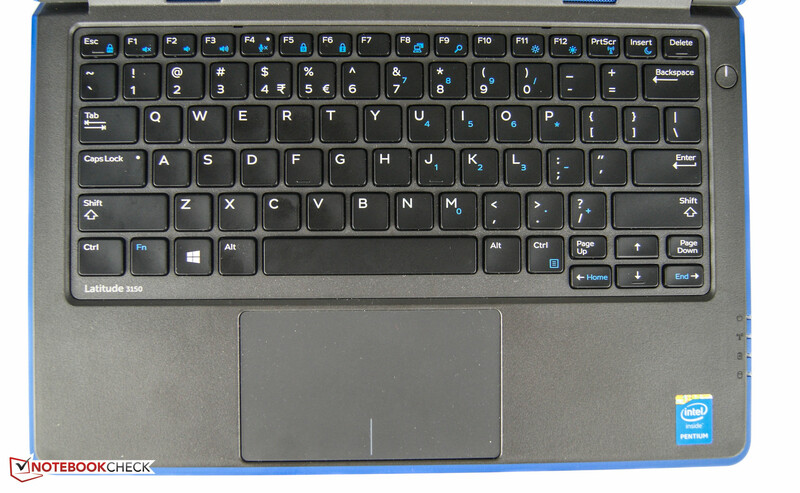 The keyboard unit in the Latitude is even suitable for longer typing sessions. Unfortunately, only the trackpad's size and surface is pleasing. Its size of 10.6 x 6.1 cm and its sleekness find our approval, but we would have hoped for more accuracy when inputting. Not only the corners and edges are the problem zones. Even precise and slow inputs are only detected inaccurately if at all. Gestures, such as scrolling through websites, usually function smoothly. Dell treats its little 11-inch Latitude to a matte TN screen with a resolution of 1366x768 pixels. 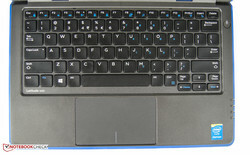 The manufacturer does not offer any alternatives in its laptop configurator. The average brightness of 219 cd/m² is sufficient in most cases and also slightly higher than that of the rival from Acer. The brightness difference between the screen's lower right and upper left area is very striking. A minor screen bleeding thus becomes visible in darker surroundings. The contrast of 290:1 and the resulting black level of 0.81 cd/m² are not enough for either a rich black or decent grayscale levels. Although the 11-inch contender only has an average brightness of approximately 180 cd/m², its higher contrast of 744:1 and better black level of 0.27 cd/m² are pleasing. Our review sample does not allow peeking either because a very viewing-angle dependent TN screen is installed. The slightest tilt changes brightness and colors extremely. In contrast, Acer's device relies on a higher-quality IPS screen that prevents these problems. However, Dell permits a tilt angle of up to 180° for an always suitable work position. 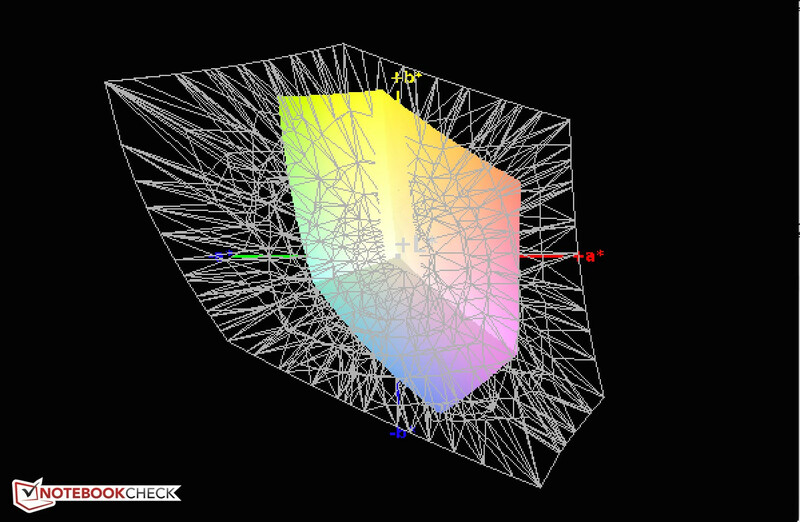 The high DeltaE shift in colors and grayscale levels are also typical for this model type. These differences lead to a heavy bluish cast particularly in gray colors. A matte screen model is predestined for outdoor use. The Latitude's low brightness ruins outdoor suitability, though. Only dim and shaded places are feasible work environments. However, direct light sources in classrooms are not as distracting. Dell's Education lineup is made for the office, Internet and multimedia world. We cannot expect more from the installed components. 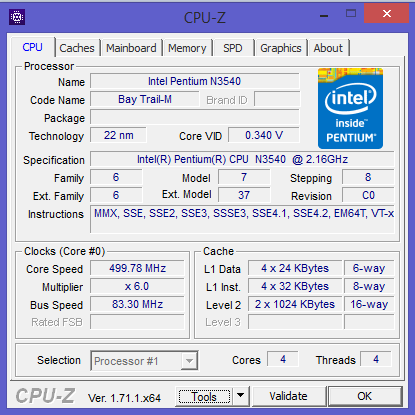 Intel's Pentium N3450 has enough performance reserves for the listed application fields - but not much more. The integrated 4 GB working memory operates in single-channel mode and can be upgraded to 8 GB. However, there is only one memory bank available. An additional 4 GB costs approximately 60 Euros (~$67) extra in the configurator. The SSD is to make working with the laptop fast. Our present Latitude 3150 is sold for 560 Euros (~$626). Other configurations can be found on the manufacturer's website. 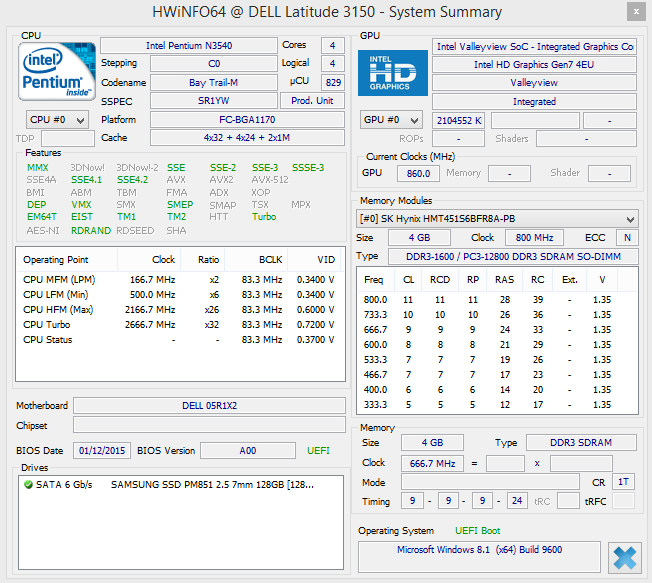 A frugal Intel Pentium 3540 at a base speed of 2.16 GHz calculates inside our Latitude. The installed CPU is based on Intel's Silvermont architecture and features Turbo mode that enables clock rates of up to 2.66 GHz. The 20-Euro (~$22) cheaper model sports an Intel Celeron N2840. Intel specifies a maximum power dissipation of a low 7.5 watts in its spec sheet. A look at the benchmarks reveals that the Latitude scores better than its rival from Acer. 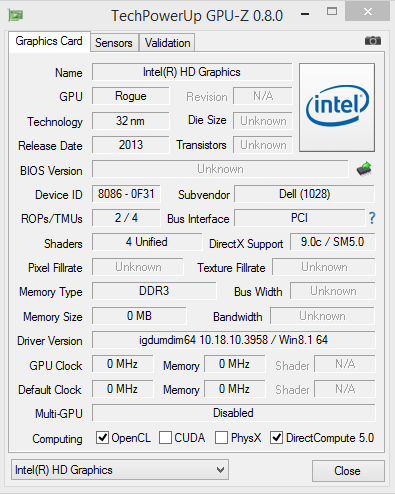 The difference to the TravelMate in the Cinebench R15 multi-core test is 15%. The advantage increases to 26% in the R11 version. The contending laptop is based on an Intel Celeron N2930 and clocks at 1.83 to 2.16 GHz, which is significantly lower than the review sample. The Turbo clock rate remained stable during the Cinebench R15 benchmarks. We could not undercut the clock rate even after some repetitions. There is no performance loss in battery mode, either. The same results are achieved here according to Cinebench R15. The combination of an SSD and a CPU predestined for office and Internet applications ensure a pleasant and responsive workflow. The system runs smoothly in total - as long as we restrict ourselves to the named fields of use. PCMark 7 confirms this sooner subjective impression. Acer's TravelMate B115-MP-C23C, with a marginally higher performance than our contender owing to the Intel Celeron N2940 and with an identical configuration otherwise, reaps in a 42% worse score than the Latitude from the Education lineup. The SSD storage plays an important role for this outcome; our reviewed Acer only had an HDD. An SSD from Samsung's SM851 lineup is installed in our present review sample. The 2.5-inch non-volatile storage has a capacity of 128 GB and is not included in the basic configuration. A 250 GB HDD is in the Latitude's basic configuration. The extra charge for the swifter storage is 42 Euros (~$46). CrystalDiskMark shows us that the SSD storage achieves faster write / read speeds and response times than an HDD, but also that it does not score very well. A processor-integrated graphics card takes care of video output. 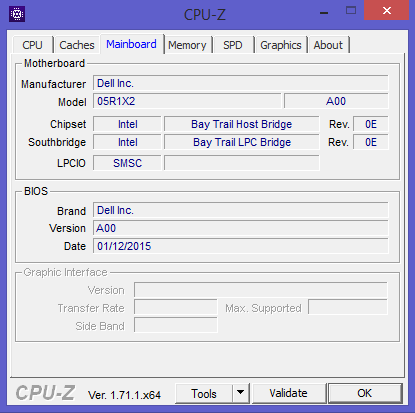 Intel's HD Graphics (Bay Trail) has a core clock of 860 MHz. Due to the fact that the Latitude has one working memory module maximum, the review sample does not support dual-channel memory. Acer's TravelMate features the same graphics unit and thus both laptops achieve identical scores in 3DMark 11. Using the laptop without its charger is often the case particularly in schools during classes. Like under the Processor chapter, there is no need to fear performance losses. 3DMark 11 achieved the same score in battery mode. The combination of a frugal CPU and integrated GPU prevent the Latitude from entering the gaming world. Even BioShock: Infinite released in 2013 did not manage smooth frame rates. The gaming faction that limit themselves to classic games will likely be happy with some older games. Which games might possibly function can be found in our article "Gaming Performance of recent laptop graphic cards." 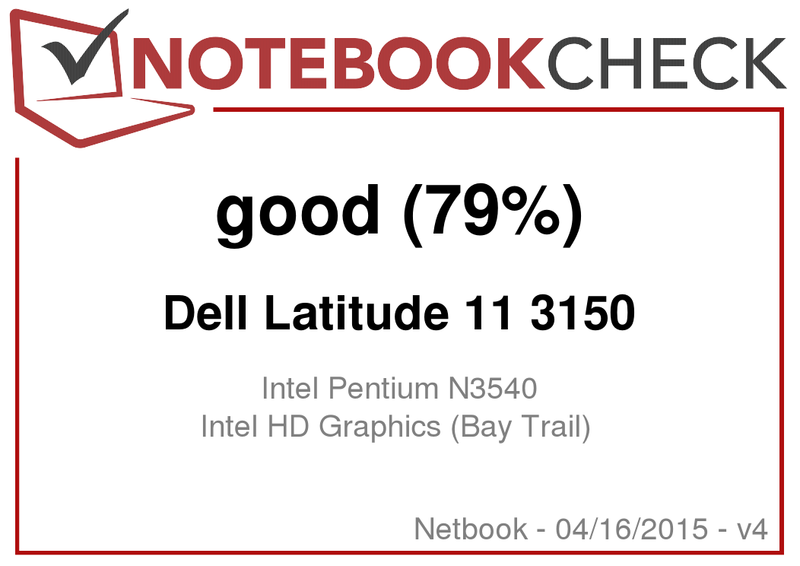 Rather than a monotonous sounding fan in computer class, the user will not hear anything at all from Dell's Latitude 3150 thanks to its passive cooling strategy. 2 hours of idling in energy-saving mode did not lead to an unpleasant temperature increase in our review sample. However, load operation is interesting. The fan-less design exhibited a somewhat deficient behavior locally. The hot spot reached approximately 44 °C, found on the underside in the display area. It was considerably cooler around the hot spot, though. Our Acer review sample also uses a fan-less design and reaches peak rates of 46.5 °C. The power supply of our review sample never reached disconcerting temperatures. We ascertained a maximum of just 33 °C, which is 3 °C warmer than in idle. We observed the CPU's behavior under extreme conditions in a stress test. 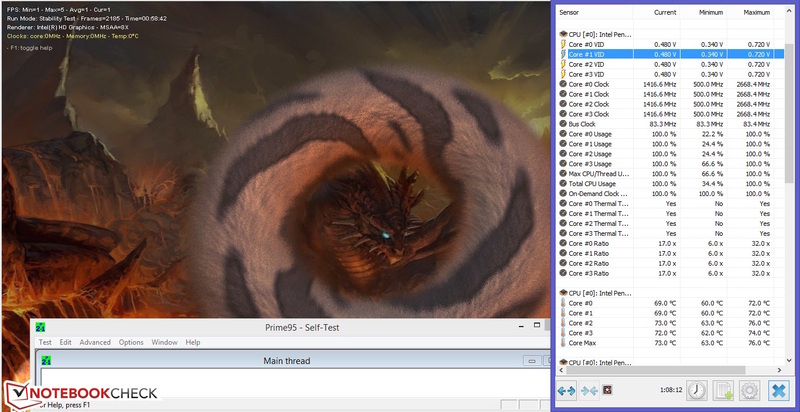 That is achieved using the programs Furmark and Prime95. 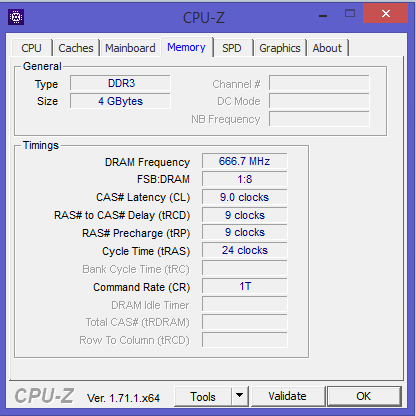 The CPU maintained its maximum clock rate of 2.66 GHz for the first few minutes. 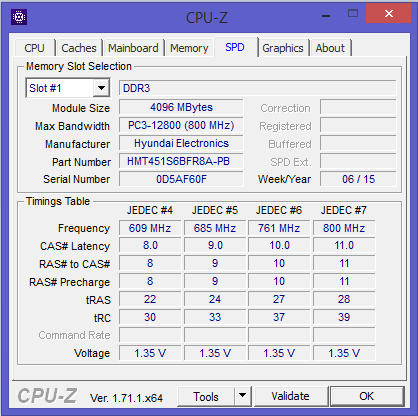 The clock speed fluctuated between 1.4 and 2.6 GHz after five minutes. The clock rate varied even more in the next hour and recurrently reached its Turbo rate for a short period. The core temperatures reached a maximum of 74 °C using this strategy. (+) In idle usage, the average temperature for the upper side is 24.6 °C / 76 F, compared to the device average of 29.8 °C / 86 F.
(±) The average temperature of the palmrest area of similar devices was 29.3 °C / 84.7 F (+1.5 °C / 2.7 F). Small dogs bark loudest. That could be the motto that describes the volume of both stereo speakers. Although a real sound spectrum is not audible and songs sometimes sound a bit randomized, the volume is convincing especially in video calls or occasional YouTube videos. As to be expected from the installed components, the review sample was never exceedingly guzzling. The idle consumption ranged from 2.8 to 5 watts. Acer's laptop demands 3 watts more here. However, this behavior changes in load where peak rates of 15.8 watts were reached. The power consumption varied between 10.4 and 15.8 watts in our stress test, which can be explained with the CPU's fluctuating clock rate. Acer's device consumes a bit less here with rates ranging from 10 to 13.7 watts. 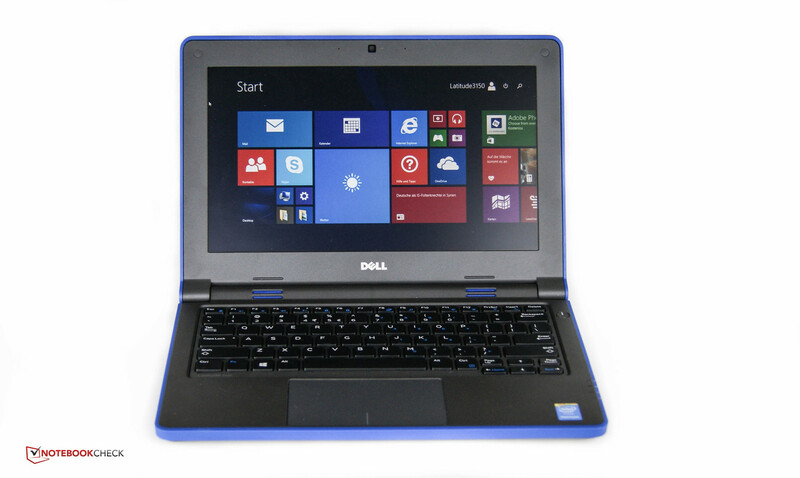 Dell equips the Latitude 3150 from the Education lineup with a 3-cell battery. The manufacturer specifies a capacity of 38 Wh (40.3 Wh read out). 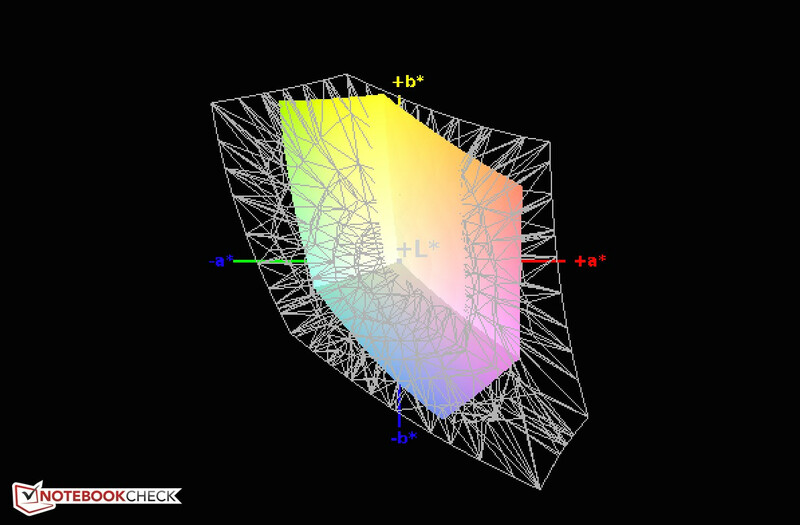 We simulated Internet browsing in our real-life scenario using the balanced Windows plan and a brightness of 144 cd/m². The Latitude first shut down to standby after almost 10 hours. Acer's TravelMate had to give up three hours sooner. That not only makes the little Latitude interesting for everyday school life but also as a portable office device. It will easily last a whole workday. 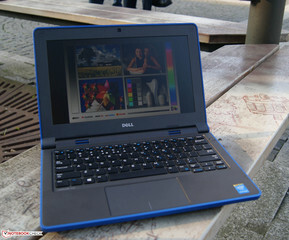 Dell's Latitude 3150 is to be durable according to scholastic demands. However, some interesting features for the "normal" user were discovered in our test. Although the casing is exclusively made of plastic, the rubber rim defies some rougher bumps. Furthermore, the keyboard and trackpad are sealed against penetrating fluids. 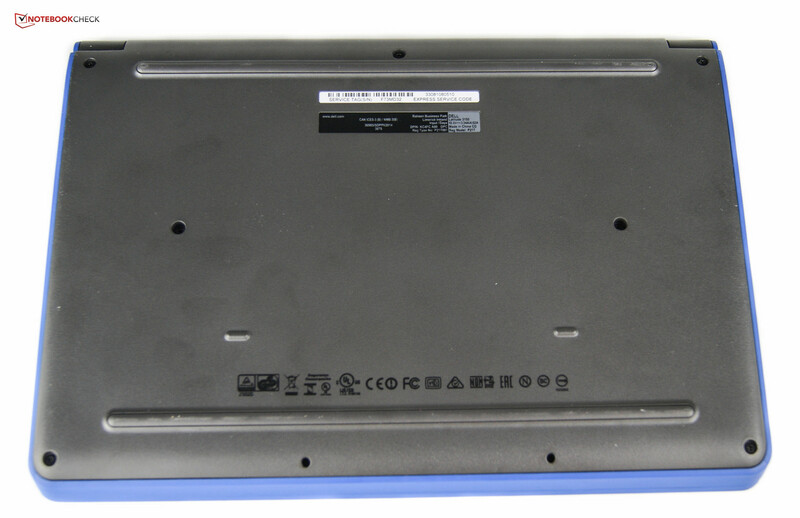 The Latitude does not have a maintenance cover, but the base tray can be easily removed, making it possible to access the largest part of the hardware. We only ascertained minor shortcomings in build regarding the display lid's stiffness and the gaps. The input devices are particularly important for office laptops. The review sample also convinced with its good keyboard here, although the trackpad could be a bit more accurate in use. After that, we looked at the screen which is ideally matte. The TN screen is very viewing-angle dependent even for its model type. In sum, the display is sufficient for office work. The high color shifts, the low contrast and the bluish cast prevent using it for professional graphics editing. 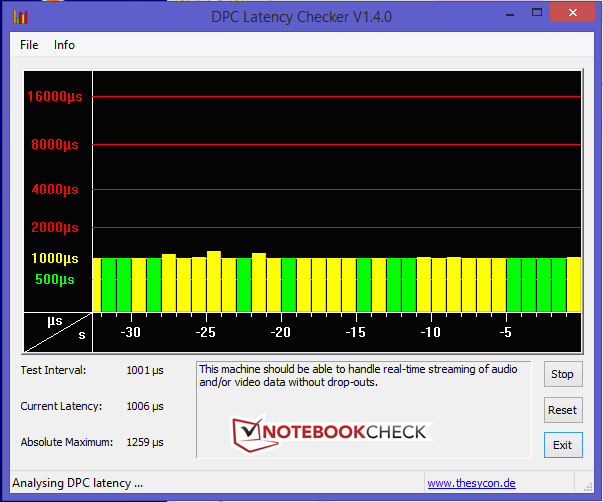 However, the review sample's system performance is good. The combination of a frugal processor and SSD ensures smooth workflow. We cannot say how well the other configurations without an SSD and a weaker CPU would score at this point. The selected components allow the manufacturer to use a fan-less design. The involved temperature development also remains within limits. The Latitude achieves a real-life battery runtime of up to 10 hours thanks to its energy-efficient components. Consequently, Dell's little 11.5-inch device will manage even longer school and office days. Overall, Dell's combination of input devices, screen model, system performance and battery life is balanced. Thus, the Latitude 3150 is a decent workhorse for school, university and the workplace.